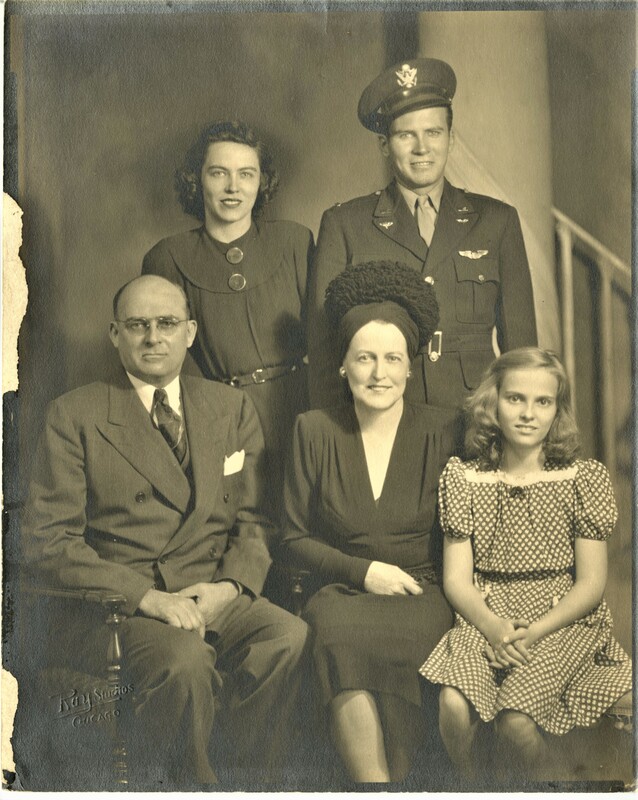 Van Hyning had a strong relationship with her family and her religion. She, her husband George, and her three children lived in Ohio and South America before moving to Chicago. Her public life took off in 1941 when she started a group called We, the Mothers, Mobilize for America, Inc. This organization and its accompanying publication, Women’s Voice, participated in energetic anti-war campaigns. According to Glen Jeansonne’s chapter about Van Hyning in Women of the Far Right: the Mothers’ Movement and World War II (1996), Van Hyning was fervently in favor of women’s empowerment. This belief manifested frequently in her activism and campaigns. Second, she wanted the U.S. to stay out of the war so that no woman’s son would die. The Mothers, as her group was known, went so far as to ask the mothers of dead soldiers to sue the president as a murderer. Clearly, Van Hyning was a complex and multifaceted individual with strong beliefs. However, it was in her magazine Women’s Voice that Van Hyning honed her anti-Semitic beliefs and arguments. She frequently claimed in her editorials that Jews were anti-democratic Communists (1). She also utilized atrocious language: Van Hyning called Jews inhuman, unintelligent halfbreeds, and criminal masterminds plotting to take over the country. She wanted them disenfranchised for committing hypothetical crimes. For such an intelligent person, it is hard to understand why she ascribed to mendacious and baseless hatreds. “Are you frightened, do you knuckle under when someone says ‘Nazi’? The implication behind the word is that you helped Hitler kill 6 million Jews. ‘Who Put Hitler in Power’ is our attempt to show that the Jews put him in power…and if any Jews were killed in Germany the Jews killed them…When 30 million Christians were murdered in Russia, was anything done by Christians? The Jews did that killing…” (4). With all of her awful language, perhaps the most terrifying part is that people agreed with what Van Hyning argued. 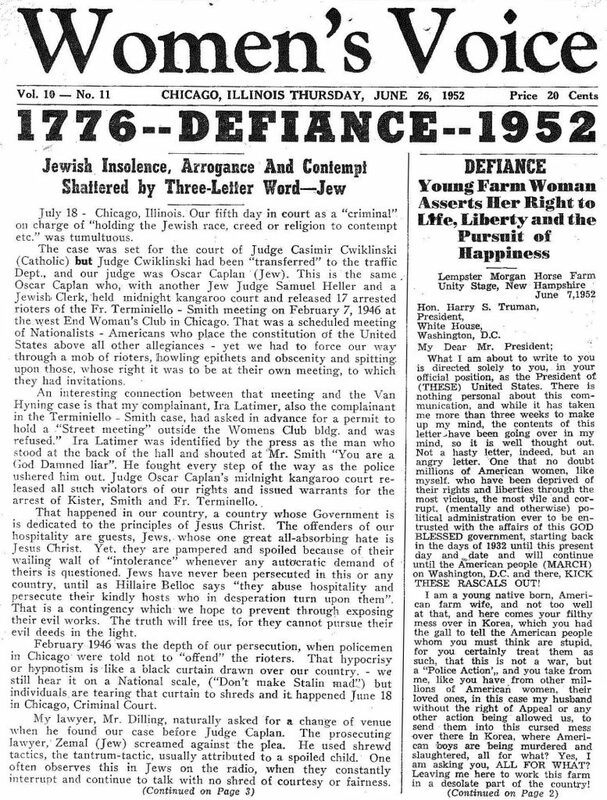 Christian groups competed to advertise with aggressively anti-Semitic language in each issue of Women’s Voice. This was her magazine. She endorsed illogical beliefs on a national platform. All her efforts against Jews did not go unnoticed. Van Hyning was arrested and accused of libel against Jews in 1952 by the head of the Chicago Civil Liberties Committee, Ira Latimer. Latimer was Jewish and both he and his organization had known Communist ties. Van Hyning underwent trial that same year. Though she was acquitted, Women’s Voice took up Van Hyning’s cause: it made her a martyr against the allegedly Jewish-influenced legal system. At the time, antisemites commonly hurled this ludicrous accusation at lawyers and judges. Her lawyer Elizabeth Dilling wrote a sickening article about the imaginary ‘Jewish cabal’ of accuser, judge, and prosecutor and their fear to try the case against Van Hyning (see the Women’s Voice article below). 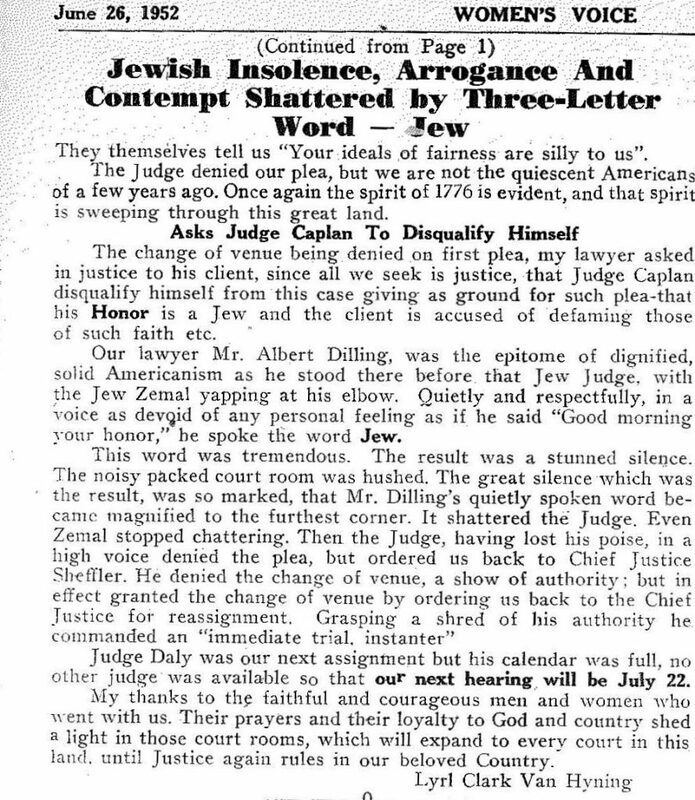 Somehow, Dilling viewed the case as a plot to overthrow a Christian America: she launched into a long diatribe about the Jewish Pharisees killing Jesus and equated the lawyers to the Pharisees, her client to Jesus. To my present-day gaze, her language in the article was not only terribly insulting and hurtful, it was entirely irrational. It was so infuriating that it made me want to rip up the page. With the magazine as Van Hyning’s public face, it is difficult to see how she valued her family except in her private correspondence. In those letters, her family caused her joy and heartache. Van Hyning maintained a longtime chatty communication with her daughter-in-law Shirley. Throughout her letters in the 1950s and 1960s, Van Hyning doted on Shirley as well as her granddaughter. At the same time, Van Hyning’s 1955 journal reveals multiple emotional events. She hated the embarrassment of waiting up for her husband to come back from a bar at 6:00 am. Later that year, she also suffered the loss of her son, Tom, in a plane crash. However, the work of Van Hyning makes me cringe. On one hand, she had two commendable strengths. First, Van Hyning demonstrated female leadership and achieved a prominent place in the public sphere. Second, she clearly loved her son and wanted to keep him alive: she literally built an organization of soldiers’ mothers in order to fight the system that sent Tom Van Hyning to war. On the other hand, with our present-day eyes, how can we reconcile what she did? She proselytized anti-Semitic and irrational verbiage that contributed to vile discourse about Jews. All the while, her fan mail was full of people expressing their admiration for her work. Acknowledging that horrifying people can have any semblance of humanity is extremely difficult. Van Hyning’s love and devotion to her family are at odds with her extraordinarily virulent anti-Semitism. I am uncomfortable with reconciling Van Hyning’s life because of the bizarre juxtaposition of her love and her hatred. At the same time, it is too easy to brush off her work and hate as purely evil. That lets her off the hook. Clearly, she was capable of human feelings. Nevertheless, in her public life she chose to espouse anti-Semitic advocacy, which is not and has never been right. This is why we need uncomfortable topics in the archives. It is our responsibility to provide access to collections like Van Hyning’s so that researchers can learn to draw their own conclusions. We have to demonstrate the complexity of human action and belief, even if we find it to be odious, hateful, and inaccurate. Sometimes, it is the only way to prove that in choosing to hate, they chose wrong. 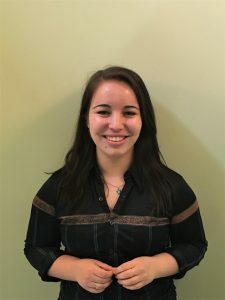 Angela is a Graduate Assistant at the WLA and is in the second year of Loyola University Chicago’s MA in Public History. Originally from the West Coast, she is enthusiastic about pub trivia and is a devoted National Public Radio listener. 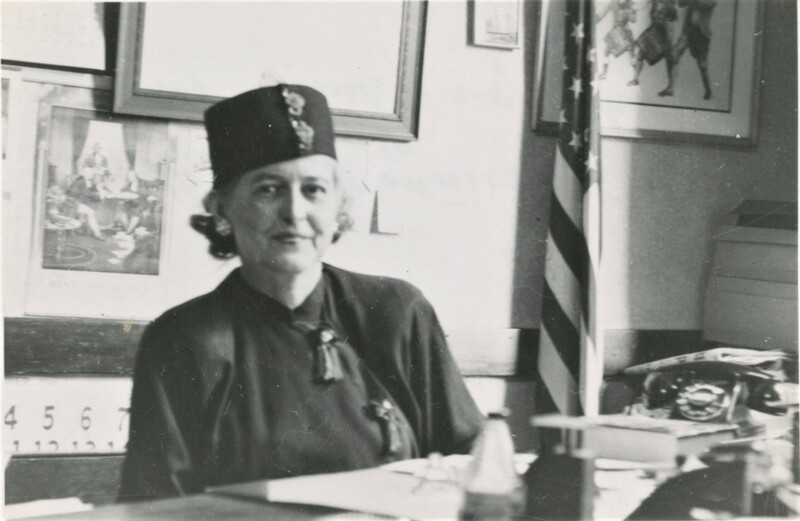 This entry was posted in Archival Practice, Collections Highlights and tagged antisemitism, Lyrl Clark Van Hyning, Women's Voice by Women and Leadership Archives. Bookmark the permalink.